DALLAS--(BUSINESS WIRE)--State Bank of Texas (SBT)—a full-service commercial bank headquartered in Dallas, TX— reported its record-setting 2016 year-end results today. As of December 31, 2016, the bank reported total assets of $740 million with net profit of $43.8 million, Return on Average Assets (ROAA) of 6.39%, and total loans of $497.2 million. 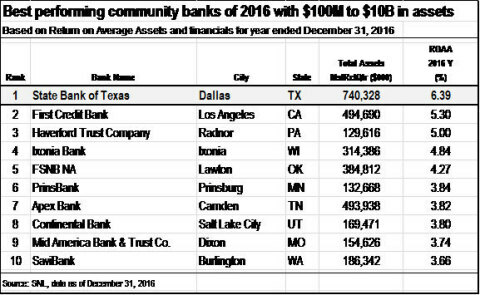 SBT ranked #1 in ROAA in the entire country amongst all banks between $100 million and $10 billion in total assets. In addition, the annual results place the bank in the top 1% of peer banks for Net Interest Margin (NIM) and Efficiency Ratio, and in the top 2% of peer banks for Tier 1 Capital Ratio. The results were announced by Sushil Patel, President of SBT. “First and foremost, we are a family owned and operated bank and that is at the heart of our story. The strategic focus of our core business—lending within the hospitality industry—remains strong. Over the past eight years we have also developed a niche in turning around failed banks. All of these factors contribute to our success.” In July 2009, SBT acquired the failed Millennium State Bank of Texas with about $80 million in total assets and in October 2014, SBT acquired the failed National Republic Bank of Chicago with about $1.2 billion in total assets. Since the end of 2016, SBT has closed on the acquisition of the failed Seaway Bank and Trust of Chicago, a transaction that boosted the bank’s total assets above $1 billion. This acquisition strengthened SBT’s position as the nation’s largest Indian-American owned- and –operated bank, and moved SBT into the top 25 by total assets amongst the country’s minority-owned banks. As of February 28, 2017 SBT had total assets of $985 million and a total loan portfolio $677 million. State Bank of Texas was founded in 1987 by Chan Patel and continues to be owned and operated by the Patel family, with Chan Patel (father) serving as CEO, Sushil Patel (son) as President, and Rajan Patel (son) as EVP and Chief Lending Officer. As the largest Indian-American-owned bank in the United States, the bank focuses heavily on lending within the hospitality industry. SBT intends to continue its formula of providing strong financial services to hard-working entrepreneurs while applying the same conservative fiscal practices that have been responsible for its historical success.